Antonio Egas Moniz was nominated for his contribution to science , the lobotomy. He wouldn't be my first or last pick for such a prestigious honor and apparently others feel the same way. 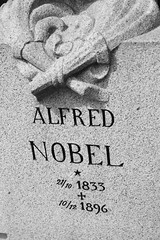 In a case of severe poetic justice, the 1949 Nobel Prize winner was shot and paralyzed by a disgruntled patient.